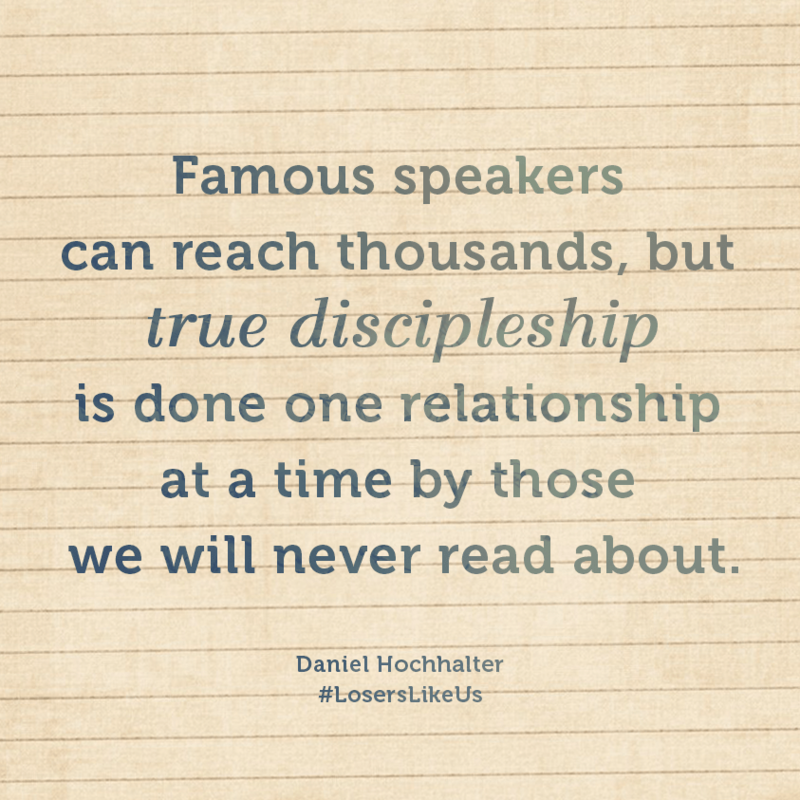 This post is adapted from my book, Losers Like Us – Redefining Discipleship After Epic Failure. Download the eBook now for only $2.99! For details, see my book page. Answer: It’s got to be Peter, James, and John. They were close to Jesus at key moments when the others weren’t – for example, on the Mount of Transfiguration and in the Garden of Gethsemane. Now, think fast! Who was Peter’s brother? Did you have to think for a minute? It’s Andrew – the disciple who lived in Peter’s shadow. All of his life, he played second fiddle to his famous brother. Unlike Peter, who seems to be on every page, Andrew has only three main “scenes” in Scripture—bringing Peter to Jesus, bringing the boy with the loaves and fishes to Jesus, and bringing some Greeks to Jesus—but in each case, he is introducing someone to Jesus. And yet in this passage, it’s because of Andrew, the second fiddle, that Peter meets Jesus. That blows my mind. Think of Peter—all his stories, all his drama, all his antics. Then consider this: if not for Andrew’s simple introduction, Peter might never have met Jesus. The next time Andrew appears, he is again acting as a facilitator. Think about it—would that little boy have offered his lunch to any other disciple? As I look at the disciples’ reactions to children at other times (Matt. 19:13–14; Mark 10:13–14; Luke 18:15–16), I imagine they might have said something like, “Beat it, kid! Jesus is far too important to bother with silly suggestions from a squirt like you.” Maybe Andrew thought so too but lacked the nerve to say so. Maybe the only reason Andrew brought the boy to Jesus was because he couldn’t think of anything else to do. What matters is, he did it. And the rest of the Scripture passage reveals the miracle that followed: the feeding of the five thousand. This passage reports that Andrew and Philip told Jesus about the Greeks, but not what they actually said. If the Greeks had made initial contact with Peter, I’m sure Peter would have been quoted—because in Scripture, Peter is always saying something quotable; his personality is just too big to keep on the sidelines. By contrast, Andrew seems content to turn people over to Jesus and fade into the background. True, society may celebrate people with big personalities, and the bigger the better; but to many of us, they seem out of reach. Something about their bigness makes us feel smaller. In Scripture Andrew, the shadow-dweller, does not have that effect on people. Andrew is not intimidating. He is safe, trustworthy, approachable. People who want to see Jesus are attracted to Andrew. Wouldn’t it be great if the same could be said about each one of us? Think about other shadow-dwellers who have sparked great miracles and movements in the church. For instance, who introduced Billy Graham, the best-known evangelist of the twentieth century, to Jesus? Who mentored Martin Luther, John Wesley, Dwight Moody, Jonathan Edwards, Martin Luther King Jr., and scores of others in their spiritual journeys? Through research, we could find out—but they certainly aren’t household names. Like Andrew, each of them was a shadow-dweller who paved the way for someone greater. 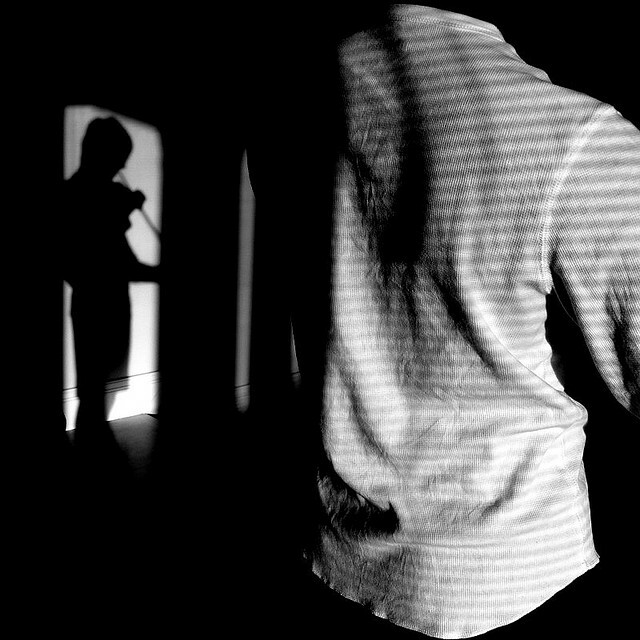 Andrew reveals a pattern throughout Scripture and church history: somewhere behind every great spiritual leader, there is usually a spiritually sensitive shadow-dweller. Peter is presented in Acts as one of the great leaders of the church, standing up to the Jewish leaders who crucified Jesus and preaching to thousands throughout Jerusalem and Palestine (Acts 2:14–41; 4:8–17). The little boy (John 6:8) becomes known throughout history as the one whose lunch miraculously fed five thousand people. We don’t know what became of him, but surely he was changed by this amazing event and went on to tell others. The Greeks must have talked about Jesus to everyone they knew, especially if they were present to hear the voice that came from heaven immediately after they asked to see him (John 12:20–33). All of these effects took place because Andrew, the shadow-dweller, stepped back and introduced others to Jesus. Andrew does not have Peter’s power to evangelize huge crowds (Acts 2:14-41), but he has the power to motivate Peter to get up and go meet Jesus in the first place. He has the power to make a little boy feel safe enough to offer one tiny lunch to Jesus. He has the power to welcome a group of Greeks—Gentiles—who might have been rejected by Peter (Peter had trouble with Gentiles, as seen in Acts 10 and Galatians 2). Composer Leonard Bernstein put it this way: “I can get plenty of first violinists, but to find someone who plays second violin with as much enthusiasm … now that’s a problem. And yet if no one plays second, we have no harmony” [quoted in Charles R. Swindoll, Improving Your Serve (Nashville: Thomas Nelson, 1984), 24]. This forces me, as a shadow-dweller, to rethink my place in God’s kingdom. I may not be a charismatic shadow-caster like Peter or some of my prominent friends—but maybe I do have a key part to play, after all. 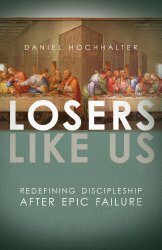 This post is adapted from my book, Losers Like Us – Redefining Discipleship After Epic Failure. For details, see my book page.